An interior view of the JET vacuum vessel, with a superimposed image of an actual JET plasma taken with a visible light camera. Materials Science is an interdisciplinary subject, spanning the physics and chemistry of matter, engineering applications and industrial manufacturing processes. Modern society is heavily dependent on advanced materials: lightweight composites for faster vehicles, optical fibres for telecommunications and silicon microchips for the information revolution. Materials scientists study the relationships between the structure and properties of a material and how it is made. They also develop new materials and devise processes for manufacturing them. Materials Science is vital for developments in nanotechnology, quantum computing and nuclear fusion, as well as medical technologies such as bone replacement materials. This diverse programme spans the subject from its foundations in physics and chemistry to the mechanical, electrical, magnetic and optical properties of materials, and the design, manufacture and applications of metals, alloys, ceramics, polymers, composites and biomaterials. This work is supported by excellent laboratory and teaching facilities. The programme also offers an opportunity to develop an introductory understanding of entrepreneurship (learning how to write a business plan, raise capital and start a company). There are also voluntary options to learn a language with the University's Language Centre. 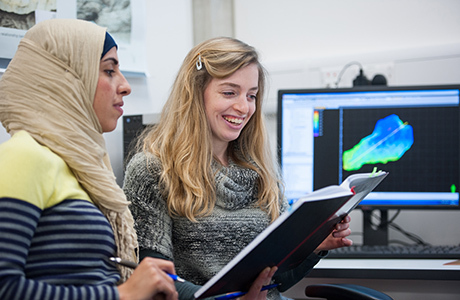 The Oxford Materials degree includes in its fourth year the special feature of an eight-month full-time research project, where you will join a research team either here at Oxford in one of the strongest Departments of Materials in the UK or, occasionally, at an overseas university or in an industrial laboratory (additional costs may be associated with a project outside Oxford). You will learn how to break down a complex problem, design an experiment or model, manage a project and communicate your results. These research skills are transferable to many career paths and are valued highly by employers. Students are encouraged to undertake a voluntary summer project in industry or a research laboratory. Recent locations for overseas summer projects have included Beijing, Zhejiang, Shanghai, Tokyo, Bochum, Krakow, Santa Barbara and Boston. A voluntary industrial tour to an overseas destination is organised in most Easter holidays. Recent destinations include France, China, Sweden, and Ontario. “Being a Materials Scientist is rather like being a chemist, physicist, engineer and mathematician all rolled into one: perfect for the all-round scientist! It is challenging, and requires a lot of effort and perseverance, but we get to carry out fun experiments involving orange jelly, molten metal and bubbles, so all the effort seems worth it. Practical classes are particularly good for developing a hands-on approach, and then we also have industrial visits where you get to see where all the work is leading you. During Years 1 and 2, your work will be divided between lectures (about ten a week), tutorials/classes (about two a week) and practicals (two or three afternoons a week). Typically the work in preparation for each tutorial or class will be expected to take six to eight hours. Year 3 starts with a two-week team design project, and about eight lectures and two classes/tutorials a week for the first two terms, while most of the third term is set aside for revision. Year 4 consists of a supervised research project spanning three extended terms. 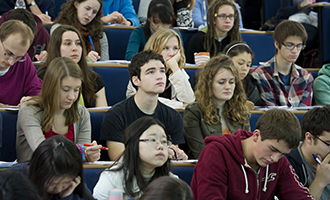 Lectures throughout Years 1-2 may be attended by the full year groups of around 40 undergraduate students; normally Materials Year 3 Options Courses lectures will be attended by a smaller number of undergraduates plus a small number of research students. Some Year 1 classes, which support the lectures, are attended by the full year group of around 40. Tutorials supporting the Year 1 and Year 2 Materials lecture courses are usually 2 to 4 students with a tutor. The Year 1 and 2 Mathematics lectures are supported by small group tutorial classes, typically up to 6 students per group. The Year 3 Options lectures are supported by small group tutorial classes, typically 8-12 students per group. The majority of tutorials and lectures are delivered by staff who are Professors or Associate Professors. Many are world-leading experts with years of experience in teaching and research. Some teaching may also be delivered by post-doctoral researchers or postgraduate research students. To find out more about how our teaching year is structured, visit our Academic Year page. Examples of current options courses are available on the Materials Science website. At the start of Year 3 it is possible to transfer to a 3-year BA degree in Materials Science, graduating at the end of Year 3. See essential further information about this on the course website. The BA is not accredited. Examples of project titles are available on the Materials Science website. For important additional detail on course content, progression and assessment, please visit the Materials Science website. This programme outline is for illustrative purposes and details may change from time to time. Years 1, 2 and 3 are currently under review - see the Materials Science website for the latest information. Essential: Candidates must be studying Maths and Physics to A-level or equivalent. GCSE-level Chemistry, or an equivalent, is also required. Recommended: It is highly desirable to have Chemistry to A-level or equivalent, and if it is not studied to this level it is strongly recommended that it is studied to AS-level or equivalent. Helpful: Further Mathematics (FM) can be helpful to students completing this degree programme but is not required for admission. For candidates studying Maths, Physics, Chemistry and FM to A-level, normally our conditional offer will require A*AA in the first three (the A* in any of these) and an expectation that you continue to study FM; an analogous offer will apply if instead of FM you are studying a different A-level in addition to the first three. All candidates must take the Physics Aptitude Test (PAT) as part of their application. Separate registration for each test is required and it is the responsibility of the candidate to ensure that they are registered for these tests. We strongly recommend making the arrangements in plenty of time before the deadline. Everything you need to know, including guidance on how to prepare, can be found on the PAT page. Updates to PAT: The test consists of maths and physics questions, which are mixed in sequence (there are not separate maths or physics sections). Formula sheets, tables and data books are not permitted. Calculators will be permitted from 2018. Guidelines about the use of calculators along with details of the syllabus and links to supporting materials which candidates are encouraged to look at for preparation are available on the PAT page. At interview, tutors are aware that students may not have encountered Materials Science at school or college. Tutors look for an ability to apply logical reasoning to problems in physical science, and an enthusiasm for thinking about new concepts in science and engineering. For more detail on the selection criteria for this course, please see the Materials Science website. Many of our graduates apply their technical knowledge in the manufacturing industry, both in management and in research and development positions. Others enter the financial, consultancy and IT sectors. A significant proportion of graduates undertake research degrees in universities in the UK and abroad. The fourth year is entirely devoted to research - a special feature of the Oxford MEng in Materials Science programme - consisting of a full-time individual research project under the supervision of a member staff. This final year has three extended terms of 12 to 13 weeks and is 37 weeks in total so you will need to budget for higher living costs in the final year, as you will be required to be in Oxford for longer than the standard terms. (See the likely range of living costs for an additional month in Oxford.) During the project you will learn how to break down a complex problem, design an experiment or model, manage your time and project, maintain systematic records, present your work orally and write a substantial report. These research skills are transferable to other career paths and are valued highly by employers. On occasion significant scientific publications result from these projects. The current MEng degree is accredited by the Institute of Materials, Minerals and Mining (IOM3) on behalf of the UK Engineering Council, towards the achievement of Chartered Engineer status. For the October 2020 to October 2024 entry cohorts the accreditation status of the degree is expected to be known in early 2020 following a normal five-yearly review due in November 2019. The final year of this course is a full-time eight-month research project. Why not have a look through the introductory reading for prospective students on the departmental website? You might also like to read the New Scientist magazine which may be available in your school or local library.